The Trump Administration has ended negotiations with California over fuel-efficiency regulations, and that’s no surprise, given recent events. 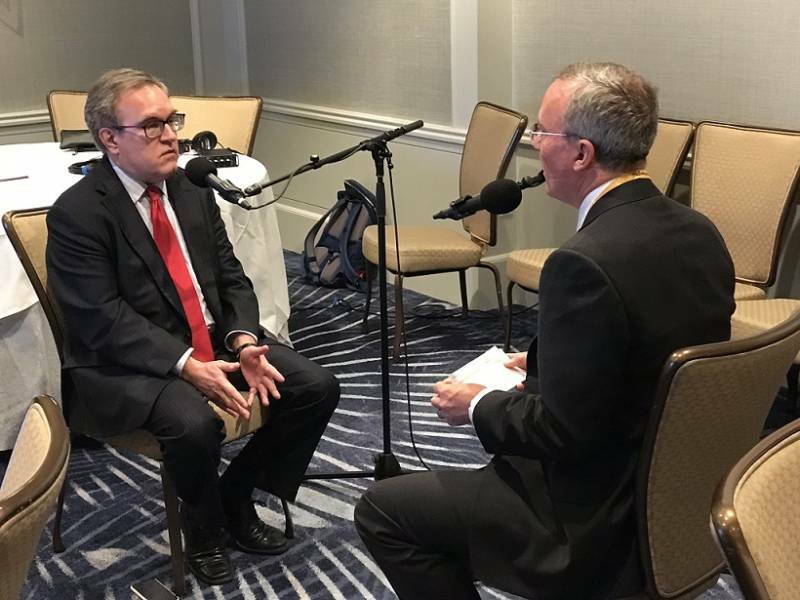 Andrew Wheeler, acting administrator for the Environmental Protection Agency, appeared in San Francisco at the Bloomberg Mobility Conference in January. As KQED and other outlets reported at the time, the relationship between California and the EPA was already well and truly frosty. We thought it would be useful to look more closely at what Wheeler says on issues central to California. In a rare interview, he spoke to Climate One’s Greg Dalton in San Francisco, and KQED reporter Molly Peterson has annotated the following excerpts from the interview. The excerpts were chosen for their relevance to Californians. Greg Dalton: During your Senate confirmation testimony, you said that climate change is not the greatest risk facing humanity, but it’s somewhere around an eight or nine on a scale of 10. So what is the Trump Administration doing to address that eight or nine challenge for humanity? Andrew Wheeler: Sure, we're moving forward with our ACE proposal, the Affordable Clean Energy [Rule], which will reduce CO2 from the electric power segment. We're also moving forth our CAFE standard, which will also reduce CO2. On the ACE proposal, it's projected to get 33 to 34 percent reduction in CO2 from the electric power sector over the life of the regulation. Dalton: Though, I think a Harvard study that questioned whether that will really reduce CO2 compared to the Obama Clean Power Plan, which I think that's trying to replace. Wheeler: Well, you got to remember the Obama Clean Power Plan never took effect. It was stayed by the Supreme Court because, in my opinion, it went outside the Clean Air Act. It's really hard to compare apples and oranges when you have a regulation that was never implemented outside the jurisdiction of the agency and the outside of the authority of the Clean Air Act versus a proposed regulation that follows the law, follows the Supreme Court precedents, and will reduce CO2. Wheeler’s right about one thing: It’s hard to compare the Obama-era Clean Power Plan and the Affordable Clean Energy Rule, but not for the reasons he cites. The two plans are based on dramatically different assumptions, both about how fast carbon emissions are already dropping, and how low they’ll be in the future.Wheeler’s pledge that ACE will reduce carbon in the electric power sector by “33 to 34 percent” comes from the EPA's analysis of its rule. But reading the fine print in that analysis, it’s clear that almost all of those emissions will go away whether or not the ACE rule takes effect: less than 1 percent of emissions reductions will come directly from the Trump-era rule. And EPA’s own analysis offers evidence the ACE rule won’t be as effective as the Clean Power Plan. I scratched out a tons-to-tons comparison of the projected emissions and promised reductions in each proposal from data tables in the analysis, and it comes out like this: By 2030, emissions under the Affordable Clean Energy Rule may be 5 to 6 percent higher than under the Clean Power Plan. On top of that, loopholes in the ACE rule could increase carbon emissions in 19 states and the District of Columbia, according to researchers at Resources for the Future and Harvard. Dalton: Coal production -- coal capacity -- in the United States is down about a third from 2010. Banks, insurance companies, hedge funds are all moving away from coal, as you well know. Do you really think that that easing regulations on coal will help bring back an industry that's in decline for lots of reasons? Wheeler: I think the important thing here is that we're not tipping the scales. The Obama Administration tipped the scales away from coal. It's not the job of the EPA -- the authority of the EPA -- to pick winners and losers between the different fuel sources. That would be either Department of Energy or FERC [Federal Energy Regulatory Commission], or even more likely, the state PUCs [Public Utility Commissions]. Our job is to set the regulations that govern the industry, and that's what we're doing, and we believe we have a responsible regulation that will reduce CO2 in the electrical power segment, following both the Clean Air Act and the Massachusetts vs. EPA decision. As Wheeler himself points out, the Clean Power Plan, the regulatory scheme that presented the greatest existential threat to coal-fired power plants, never took effect. What really tipped the scales against coal was the market itself: more than half of mines that were open a decade ago have closed, and the Energy Information Authority reports that U.S. coal consumption was the lowest last year in 39 years.Wheeler says it’s not the job of the EPA to pick winners and losers among fuel sources. That’s not entirely accurate. It is the job of the EPA to regulate greenhouse gases. In 2014, an opinion by Justice Antonin Scalia in the case Utility Air Regulatory Group vs. EPA found that greenhouse gas emissions don’t automatically trigger federal regulation. But the court also decided that the EPA could limit greenhouse gas as a “pollutant subject to regulation” for big power plants that were already regulated for other pollutants. So, in effect, regulation can tip the scale toward cleaner fuel sources, because it’s meant to limit pollution. Wheeler: Well, hopefully we can end up with something as a regulation that California likes and can agree with, but, you know, California's only looking at it as one policy issue and that is energy efficiency. The Trump Administration, the federal government, we're looking at more than just one policy issue, including highway safety, lives saved. Our proposal will save 1,000 lives per year as opposed -- over and above the Obama proposal. Dalton: Is that because of bigger cars? What's the basis for that? Wheeler: It's older cars. Right now, people are keeping their cars longer because the high price of cars. The average lifespan for a car on the on the road, the average age of a car on the road, today is 12 years. It used to be eight years. People are holding onto their cars longer. When you buy a new car, you buy a more energy-efficient car, you buy a safer car, and what we're trying to do with our CAFE proposal is bring down the cost of a new car, which would bring us down [by] around $2,300 per car on average. That will incentivize more people to buy newer, safer, more energy-efficient cars. Dalton: The cars that get better gas mileage cost less to operate over the lifetime of that car. People who have more fuel-efficient cars spend less on gas, so isn't that also saving Americans money, if they have more efficient cars? Wheeler: If they actually buy the newer cars. As we've seen over the last 10 years, people aren't buying the newer cars. Part of that is the Obama Administration looked at some faulty -- we believe -- looked at some faulty consumer profiling information as far as what people want to buy, what people are purchasing today. And right now electric cars make up about two percent of the sales. In order to completely comply with the Obama CAFE standards by 2025, you'd have to jumpstart the electric cars up to 30 percent. We just don't - you know, the data we've seen about what the American public wants to buy, what they're interested in buying, doesn't match that. Dalton: [Auto manufacturers] also have said that they don't want to roll back the auto-emission standards. Ford has come out and said that. Other auto companies have said, "We want certainty. It's not good for industry, for the federal government and California to fight it out in court," and they don't know who's gonna win. So what about the voice of industry here, who’s saying, "Hey, we want some clarity," which is what they always want? Wheeler: Well, industry came to us the beginning of this administration and said that they can't meet the Obama standards going forward. And you know, right now, they're not. If you look at the 2016 data, they paid $77,000,000 in penalties because they did not meet the 2016 Obama CAFE standard, and that amount is supposed to increase dramatically over the next 10 years. The source of Wheeler’s penalty number isn’t clear. For the years between 2010 and 2014, auto makers paid about $100 million in CAFE penalties. Fiat Chrysler has paid $77 million for the model year 2016 alone, after penalties rose to match inflation, but was the only automaker to fall short in 2016.Wheeler is mischaracterizing the industry’s perspective. Manufacturers may have asked for some regulatory relief in private, but in public they’re singing a different tune.“We support increasing clean car standards through 2025 and are not asking for a rollback,” wrote Bill Ford about his company’s position, almost a year ago. Honda says they’re not asking for a rollback. Mitch Bainwol, CEO for the industry’s lobbying umbrella, the Auto Alliance, told Congress that meeting CAFE standards was challenging -- but he didn’t say they can’t do it. Dalton: There's legislation in Congress now. Pricing carbon pollution is now on the table again; it hasn’t been that way in about ten years or so. There's something called the Carbon Dividend Plan that was co-authored by James Baker, George Shultz and supported by one of your predecessors, Christine Todd Whitman; as well as Rob Walton, the scion of the of the Walmart family; Ben Bernanke; also corporations: ExxonMobil, Shell, BP, Excellon, AT&T. This is the corporate and political establishment. What do you think of that plan? Wheeler: ...A carbon tax is one of the most regressive taxes you can put on the American public because lower income people, people on a fixed income, end up paying more of a percentage of their income. Well first of all, they paid more of a percentage of their income for energy today than people in upper brackets, so it really does hurt lower income people, people on a fixed budget. And it’s not just - I know they're talking about paying dividends back to people, so they have a rebate for their gasoline, or a rebate for their home heating and air conditioning, but what about the dividends to make up for the increased price on goods from the small businesses, from the restaurants they go to? From the local McDonald's, where they're paying more for their electricity? So it's a regressive form of taxation. It may be economically one of the easier ways of addressing CO2, but it's really harmful to low-income people. Supporters of carbon taxes argue that this way of framing a discussion around the costs of climate change is misleading. An argument for a carbon tax is that we already pay one, through negative externalities, like the concentration of asthma-inducing smog, and increased vulnerabilities to heat. Those costs of climate change already affect the health and economic well-being of poor people disproportionately. A carbon tax would more accurately reflect the economic, social and health costs to these emissions.Economic studies show a carbon tax could be regressive, and to address that, economists propose methods to prevent pain in low- and middle-income tax brackets. Lump-sum rebates, targeted rebates, or cuts to existing regressive taxes could blunt the regressive effect, and acknowledge the costs that some Americans already pay more than others. Dalton:And what is the way -- if you say climate change is an eight or a nine, I heard you talk about the clean energy plan -- what are the other ways to tackle climate change? Because we're seeing storms, fires and deaths in California. Storms are more severe, Houston, et cetera. It's getting very expensive. Wheeler:It is a global problem. It needs to be addressed globally...But also equally important is looking at adaptation, and making sure that when a natural disaster strikes, we rebuild to sustain a larger storm surge...As far as the California fires, and this is a topic that I got into in my confirmation, I believe the unofficial name is the Little Hoover Institute here in California, that drafted a report based upon the fires, and they blame the forest management practices of the last hundred years more than climate change. I think it's important not to lose sight of that aspect because we really do need to have better forest management in order to stop the wild, destructive fires that we've seen in recent years. This is a mischaracterization of the Little Hoover Commission report, whose authors wrote last May that “[p]oor management policies that interrupted the natural and historical cycle of fire, combined now with a changing climate, have left forests vulnerable to disease, insects, catastrophic fire and drought.”According to the Congressional Research Service, the federal government owns about 46% of California’s total land, much of it forested. Federal and state forest managers and fire authorities have emphasized that they’re working together to shift away from managing only by suppressing fires. Public officials also have reiterated in the last year that climate change compounds the urgency of the problem. All of that work comes as President Trump has blamed California for “poor”" forest management, threatening on Twitter to take away federal money. According to a recent Buzzfeed report, FEMA says the President never did issue that order. Greg Dalton is the host and founder of Climate One, a podcast and radio show on NPR Now that engages high-level leaders from business, policy, advocacy and academic circles in a conversation about building a sustainable economy and stabilizing the Earth’s climate. Climate One is recorded with a live audience at The Commonwealth Club.